Pastor Maldonado converted his debut F1 pole into his first ever Formula 1 race win this afternoon in Spain. In doing so he also ended his team's eight year winless drought, but post-race celebrations inside the Williams garage came to an abrupt halt when fire broke out at the rear of the building. The paddock rapidly filled with acrid smoke as team personnel rushed to bring the situation under control. 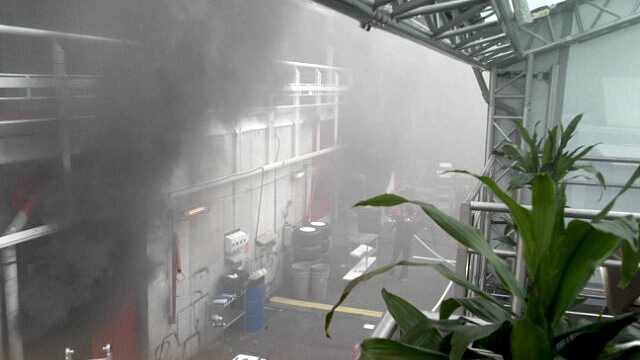 Toro Rosso driver Jean-Éric Vergne took this picture of black smoke exiting into the paddock from his team's motorhome. In the UK, two broadcasters were on air at the time, the BBC caught attempts to dose the flames with hoses. While in the pitlane, Sky TV were filming post race interviews and caught the moment the blaze took hold. Before local firefighters could arrive on the scene, team members had things in hand, although a number of people had been reported injured. The garage was left charred, soaked and completely gutted. It is notable, as was also the case with a recent fire in the Lotus team hospitality unit, how quickly other teams came to assist. Many of the injured work elsewhere in the paddock. This evening, Williams released the following statement. Four team personnel were injured in the incident and subsequently taken to the medical centre. Three are now receiving treatment at local hospitals for their injuries, while the fourth has been released. The team will monitor their condition and ensure they receive the best possible care. The team, the fire services and the police are working together to determine the root cause of the fire and an update statement will be released in due course. Additionally, Force India tweeted "Our guy is OK on the whole. Just some coughing from all that smoke." While Caterham confirmed their wounded "Our people have been taken to the medical centre for examination; one with a minor hand injury and three with respiratory issues". The FIA totalled the full extent of human damage at 31 people. FIA Statement on Fire: 31 F1 team members seen by circuit medical staff in total. All released, except for 7 transferred to local hospitals. We followed the unfolding events live as best we could, but it would appear that F1 got a little lucky today. At the time of the incident the Williams garage was jam packed with well wishers, probably the only time during a weekend any garage sees that quantity of bodies. That no-one was seriously hurt is incredible, but successful race teams might consider celebrating rather away from fuel drums in transit in future. 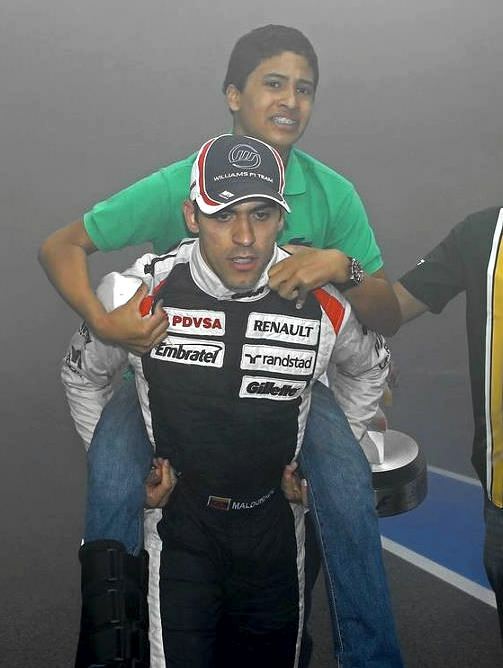 We'll leave you with this shot of the driver of the day, race winner Maldonado, carrying his 12 year old cousin out of harm's way - assisted by a member from a 'rival' team.